nice grouping. How can I get it to work work with Items that have a White Background ? Or how can I set the TopGroupingItem in the Front? I’m sorry I don’t understand your question. Does the code I shared has problems when you want to use a background ? 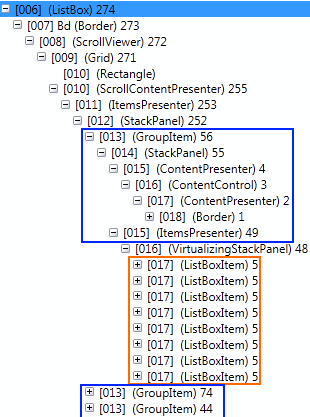 yes when my listbox item have a background, then the item is displayed over the TopGroupingItem. I test it with Panel.ZIndex=”-1″, but this dosn’t work. Sorry for the very late reply. I finally had time to take a look and was able to improve this scenario. I updated the source code in the blog post with the latest version. I am seeking a lightweight groupedlist with sticky headers alternative for the Windows Phone 8.1 WinRT platform. Could you give me some pointers on how to implement this on Windows Phone 8.1 WinRT. I might even be more satisfied with a non-MVVM i.e. non-itemssource-databound solution.